The Group conducts operations in three areas of business under the following structure. In this business, the Group manufactures and sells lamps, including lamps for projectors, halogen lamps for general lighting and LED lamps. 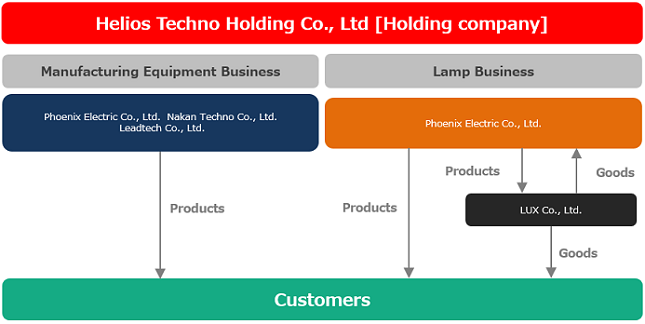 [Company names] Phoenix Electric Co., Ltd., and LUX Co., Ltd. The Group manufactures and sells such equipment as orientation film printing devices and specialized printers. [Company name] Nakan Techno Co., Ltd., and Leadtech Co., Ltd. The Group manufactures and sells industrial equipment, as well as testing and measuring equipment. [Company names] Phoenix Electric Co., Ltd., and Nippon Gijutsu Center Co., Ltd. The Group develops and designs automation/labor-saving equipment and software for control unit. [Company name] Nippon Gijutsu Center Co., Ltd., and Technolink Co., Ltd. The Group conducts human resource placement and business contracting operations for technological, general manufacturing and other companies. [Company name] Nippon Gijutsu Center Co., Ltd.